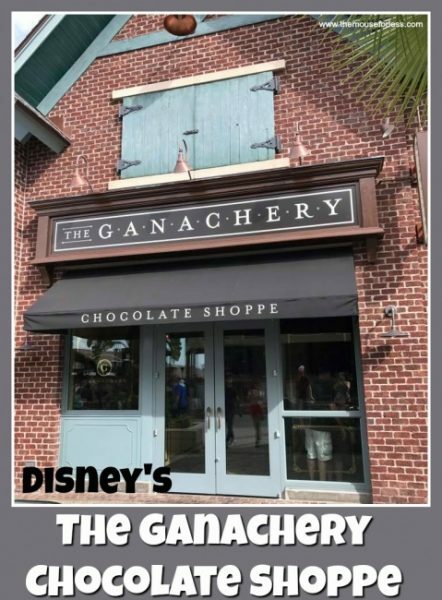 The Ganachery at Disney Springs is a high-end chocolate retail store. Just like everything else at Disney there is a backstory to this fancy chocolate shop. According to Disney, “the shop used to be an apothecary where residents of the springs came for medicinal needs. Then, as the story goes, the space was taken over by a South American couple who turned their love for the cocoa bean into a fantastic chocolate shop.” Just as the story goes, it is certainly a fantastic chocolate shop. 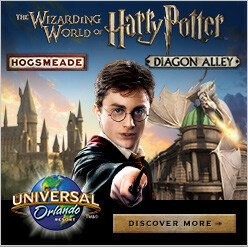 Stop by this small shop for some spectacular treats or order online through the ShopParks Disney app which is available for download from Apple or GooglePlay. 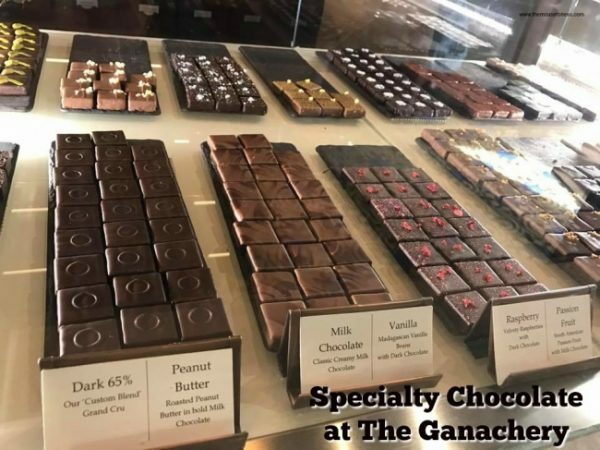 The chocolate creations at the Ganachery are made right in front of guests in the kitchen area that gives guests a front-row seat to the chocolate making process. It may be a tough decision to choose which kind of chocolate to try because there are so many varieties. You can get dark chocolate, milk chocolate, or white chocolate at various percentages of cocoa concentration. You can get chocolate that is themed to Disney characters or chocolate bars that are flavored to represent the Disney parks across the globe. The S’more is a fan favorite as well as the hot chocolate to which adults can add Bailey’s to create an even more decadent treat. Of course, the ganache at the Ganachery is the star of the show. Ganache is a small, rich, cream-filled chocolate treat. There are glass cases housing freshly prepared chocolate ganaches, and the specially trained Cast Members are there to help you decide which flavors you will enjoy the most. 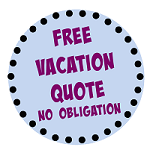 You can purchase just one to enjoy right then, or get several to take home and enjoy later. If you opt to take some home the Ganachery continues the upscale experience by delicately wrapping up your chocolate treats in a special box complete with tissue paper and a nice note. Guests will likely find that they can spend more time than expected in this chocolate shop. Be sure to take a glance at the themed decor of the Ganachery. There are chocolate making utensils decorating the shop along with other chocolate themed embellishments. The shop smells delicious as it is full of chocolate and there is typically more chocolate delights being created in the open-air kitchen area. This area is where the magic happens and the hard-working cast members are happy to share their knowledge about the candy making process. Knowing all the work that went into the creation of your chocolate treat makes it that much more delicious when you bite into the chocolatey goodness. A visit to the Ganachery can be a great addition to your time spent at Disney Springs.